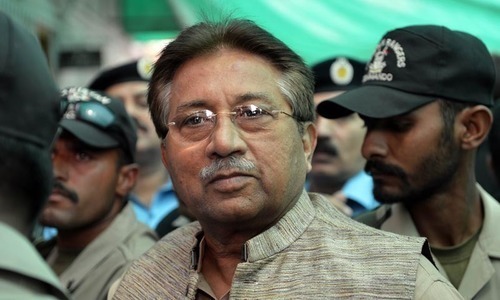 ISLAMABAD: A special court seized with treason trial against former president General (r) Pervez Musharraf in connection with his unconstitutional decision to impose emergency in 2007, has failed to make any headway, as the former president’s counsel raised questions over the decision to record his client’s statement via video link. The three-judge bench headed by Justice Tahira Safdar accepted an affidavit submitted by Musharraf’s lawyer on Tuesday and sanctioned the questionnaire for the former president to respond to. To which, his counsel said the presence of the ex-strongman in the court was essential, refusing to record his statement via link. The prosecution said that Musharraf’s not recording his statement in the case should not hinder it, and that the trial should move forward. However, the bench sought assistance to find out whether the former president could record his statement via video link within the parameters of the law. The proceedings of the treason case — being heard by a special court — had come to a halt since Musharraf has not returned to the country since 2016. He left the country on the pretext of an illness and hasn’t returned, citing security reasons often. The special court had frozen his passport, but then chief justice Saqib Nisar revoked the decision, giving Musharraf a chance to come back. On March 7, hearing a plea pertaining to snail-paced treason of the ex-military dictator, the chief justice of Pakistan said that the statement could be recorded through a video link if the former army chief refuses to return to Pakistan.